‘Blanche’ absinthe (white) made from a selection of plants including grand wormwood and Roman wormwood. It is made in the spirit of Val de Travers absinthes and is created exclusively by distillation, which gives it its transparent colour. To be served like during the Belle Époque! 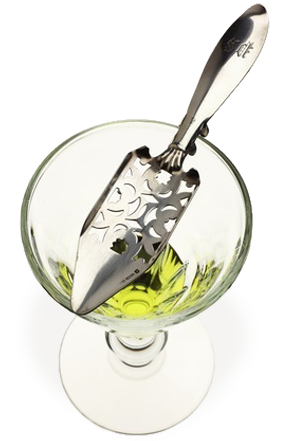 Pour a measure into a glass then sweeten if desired, by dissolving a sugar cube, placed on the absinthe spoon, by slowly pouring water over it.